Donna Ellis welcoming attendees at the 2016 CIPWG symposium. Invasive plants are a major threat to Connecticut’s environment and economy. They disrupt ecosystems and wildlife habitat as they overtake native plant species, leading to a loss of biodiversity, human health risks and negative economic impacts for landowners and land managers, communities and commercial industries. The biennial symposium of the Connecticut Invasive Plant Working Group (CIPWG) will bring hundreds of people to the UConn Student Union in Storrs on October 4 to share the latest information on invasive plant identification and management strategies and promote the sowing of native and non-invasive alternatives to combat this growing problem. Nationally, invasive plants cost well over $100 billion a year in damage and associated control efforts. Connecticut and its towns have faced budget cuts that have reduced the means for fighting invasive species. Ellis and the late biologist Leslie J. Mehrhoff established CIPWG in 1997, seeing the group as a way to increase invasive plant awareness and advocate native and non-invasive alternatives. The working group is a consortium of individuals, organizations and agencies, including UConn Extension and PSLA. 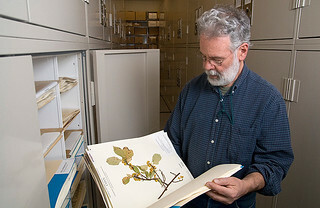 Les Mehrhoff worked in the Department of Ecology and Evolutionary Biology as curator of the George Safford Torrey Herbarium at UConn. Photo courtesy of UConn Today. CIPWG held the first symposium five years later, in 2002, as a way to gather diverse individuals and groups together for a daylong event on practical solutions to invasive plant issues. The symposium programming speaks to a range of audiences, including state and federal workers, municipal personnel, recreational and commercial gardeners, landscapers, conservationists and anyone who wants to learn and do more about invasive species. Each symposium features presentations from national, regional and local experts as well as citizen volunteers. While the theme changes with each event, the focus is always on management strategies. “One of our goals is to impart knowledge and also to help those unfamiliar with the subject to understand what’s at stake and ways they can get involved. Invasive plant issues affect all of us,” says Ellis. Several invasive plant species have made a home in Connecticut, including Japanese barberry, autumn olive, multiflora rose, phragmites, water chestnut and hydrilla. These plants grow rapidly, disperse easily over wide areas, outcompete native plants for resources and cause many other problems. The Japanese barberry shrub, for example, provides ticks with an ideal environment to thrive, increasing the dangers to public health from tick-borne illnesses. Hydrilla has been found in parts of the Connecticut River. The submersed perennial weed can quickly grow into an entangled mass of stems and leaves, affecting recreational activities, such as swimming, fishing and boating. Dense mats of Hydrilla can trap fish, impede waterflow and movement (e.g. the uptake of water from fire water ponds) and cause damage when the water control structures of dams, side-stream wastewater treatment plants and hydro power plants become clogged. Removing invasive species is expensive and problematic, given the resiliency of the plants, explains Ellis. They often have complex root systems and their seeds easily disperse. Prevention and early detection are crucial for controlling their growth and spread. CIPWG’s symposium recognizes that widespread education and training for identifying and removing these plants is the most cost-effective approach. “There’s no such thing as an overnight success when it comes to removing invasive plants. We say that you can’t ever let your guard down. We encourage people to monitor for a number of years, as their seeds can live for many years and parts might remain in the ground that allow these plants to grow back. 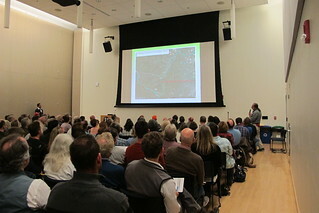 While we focus on detection and removal, we also hold sessions for participants on native plants and pollinators and non-invasive alternatives to help re-shape existing sites,” says Ellis. CIPWG member Bill Moorhead presenting a talk at one of the concurrent afternoon sessions. The symposium features a keynote talk and a general session for all attendees leading to afternoon breakout sessions where participants join early afternoon and late afternoon groups, selecting from six different topics. 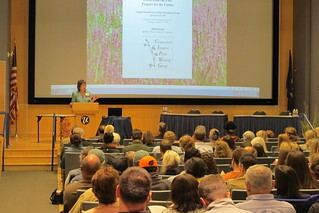 Judy Preston, the program coordinator for Connecticut Sea Grant, is delivering this year’s keynote presentation on selecting the best plants for sustainability and restoration. The general session will feature CIPWG’s Emmett Varricchio introducing an invasive plant management calendar to aid detection and removal. 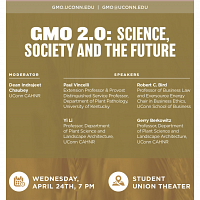 Other speakers addressing the assembly will include College of Agriculture, Health and Natural Resources Interim Dean & Director Cameron Faustman and Land Conservation Director Lindsay Suhr of the Connecticut Forest and Park Association. 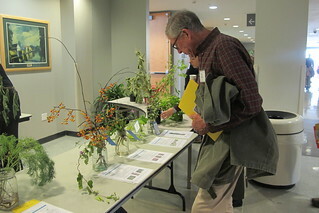 The CIPWG symposium features live invasive plant specimens and native alternative species. The symposium also features informational exhibits presented by different organizations and research posters created by high school and college students. Details on the event’s speakers and presenters are included in a booklet distributed to participants and available online on CIPWG’s website. The booklet includes abstracts, biographies and contact information. “The booklet fulfills part of the aim of the symposium, which is to help people connect and stay in touch. It also gives professional recognition for the work people do by having their abstracts in a publication,” says Ellis. The CIPWG symposium also offers Pesticide Recertification and Continuing Education Credits for attendance to further career development. 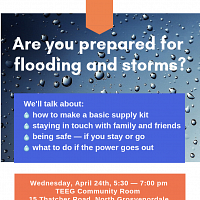 Registration for the event can be completed via a mail-in form or online. CIPWG symposia are open to the public. This year’s symposium can host 500 registrants and the event regularly sells out so interested parties should sign-up as soon as possible. 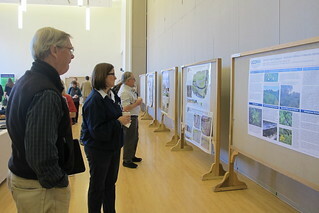 CIPWG symposium attendees visiting the poster displays. “We always welcome more people in our mission to educate about how invasive plants can be managed and removed and how to select native plants to restore pollinators and wildlife habitat. This symposium can be a great introduction or enhance your knowledge. We see new faces and old friends, and the symposium is a wonderful event that brings everyone together to share solutions, advice and, most importantly, to coordinate,” says Ellis. In addition to the symposium, CIPWG has also organized a field trip entitled “Non-Chemical Japanese Barberry Management in Avon, CT: A Success Story.” The event will take place on October 6. The field trip registration is separate from the symposium. This entry was posted in Environment, Events, Extension, Plants, Stories. Does this course/workshop have CE ASLA credits? 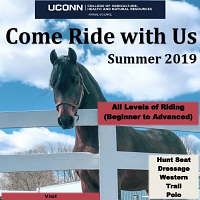 All recertification credits and CEUs are listed here: https://cipwg.uconn.edu/2018-symposium-ceus/. 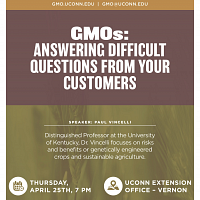 I’ve forwarded your question to Donna Ellis at donna.ellis@uconn.edu to ask if there will be any ASLA credits available. I included your email so she should respond directly to the address you used to post this question. Thanks!